In was 1966. England on the World Cup. At primary school I was3rd choice centre-forward. Inspired by Gordon Banks I decide to become a goalkeeper. Within weeks of the new season starting I was 1st choice goalkeeper in the third of my four senior primary school years. I used to go over to the playing fields at Rowheath were one of the Bournville teams used to play on Saturday; they let me warm up with them….surprisingly tolerant of an annoying nine-year old. That was all down to Gordon Banks. I kept goal (not always well, but I loved playing) for the next 32 years until I hung up my boots. 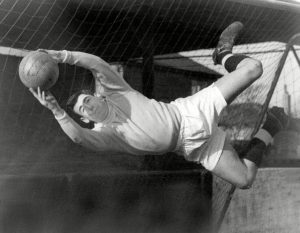 Gordon Banks was brave, calm, organised and modest. An inspiration to anyone who was or wanted to become a goalkeeper.